How Do I Stop People From Using Covert Hypnosis and Mind Control Techniques on me? You know I get that question almost as much as I get people asking me how to use covert hypnosis and mind control techniques on people. The truth is that much like learning how to defend yourself in a physical context and like many martial arts disciplines emphasize that you must learn how to fight with a particular weapon before you really know how to defend yourself against it. I plan on doing a series of articles in the future that deals with building your defenses and strengthening your resistance to being influenced against your will. But for now here is a great ( and long) article that talks about building your resistance to un-ethical persuasion. Steve K. D. Eichel, Ph.D. The need to develop the ability to resist influence is examined in light of the existence of totalistic groups and individuals that employ a variety of unethical manipulative techniques, including hypnosis. Relevant research in social psychology and experimental clinical hypnosis suggests that three factors may be important in developing resistance. First, becoming acquainted with the social psychology of manipulation and attitude change will be an asset to understanding mind control. Second, having a specific knowledge of experimental and theoretical as well as practical hypnosis is also important to resistance. Third, one's fund of general information can be vital in resisting manipulation. An awareness of the limits of one's knowledge base, and a willingness to add knowledge when one is unsure of the validity of what is being said is important. Finally, specific techniques for resisting influence as it occurs are discussed. Most hypnotists and therapists are concerned with finding ways to overcome resistance, not with ways of building it up. Yet the ability to resist influence may be an important skill to develop, especially in view of the many groups and individuals seeking to covertly modify behaviors, thoughts and feelings. Destructive religious cults, certain "mass therapy" groups, many individuals claiming to be "psychics" and/or "spiritualists," and a wide assortment of political extremists on both the Radical Left and the Radical Right all seem to be vying for our attention, if not our hearts and minds. The equating of hypnosis with "mind control" or "thought reform" has been a misconception professional hypnosis organizations have been combating for years; ethical practitioners do not employ hypnosis as a means of influencing people against their own self-interest. Yet the technique of using a surgeon's scalpel can be employed for harm as well as for healing. There is ample evidence that covert hypnotic techniques can and are being used (unethically) to manipulate feelings, thoughts and perceptions—typically without the "subjects" even being aware that they are being manipulated or influenced against their "free will" (Dubrow Eichel, 1984; Dubrow Eichel & Dubrow Eichel, 1985). It is a misconception that brainwashing always involves thugs who torture or threaten their victims, or connect them to bizarre-looking electronic equipment in order to force a marked personality change. The Central Intelligence Agency's MK-ULTRA program, which sought to discover overt methods of mind control (including the use of electroshock, sensory deprivation and psychedelic drugs), is a case in point. The MK-ULTRA program was ultimately deemed a failure, yet it nonetheless did much to foster the "torture, technology and drugs" myth of brainwashing. Ironically, the fact that the U.S. government could not produce a reliable technology of thought reform using these blatant methods may have created a false sense of security among the general public. After all, if the CIA experts failed to brainwash their subjects, then surely nobody else could, and the average citizen had no reason to fear being "brainwashed." Dr. Philip Zimbardo, a Stanford University psychology professor who is perhaps the foremost American expert on the topic of social manipulation and mind control, is not so optimistic; the CIA failed to brainwash people, he claims, not because their methods were too "soft," but because they were overt, blatant, and obvious. § provide a sense of "us" versus "them,"
§ employ covert or disguised hypnotic techniques. Motivation is an important issue. A subject's motivation can range from loneliness and mild depression to being at a point of transition in life; from searching for spirituality, altruistic relationships or deeper meaning to impatience with or resistance to "conventional" religious or psychotherapeutic routes of discovery (Clark, Langone, Schecter, & Daly, 1981; Cunningham, 1984; Schwartz & Kaslow, 1982). Contrary to the beliefs of many, vulnerability to mind control techniques is not a sign of psychological or intellectual weakness; there is a vast body of research that clearly demonstrates that "average" or "normal" individuals can be highly susceptible to covert attempts to influence them, and that most people are, in general, not particularly good at recognizing when their behavior has been externally manipulated (Festinger & Carlsmith, 1968; Freedman, Carlsmith, & Sears, 1974, pp. 341-375). Given enough time and the proper environment, the motivated subject is highly vulnerable to brainwashing. § specific knowledge about the psychology of manipulation. § Manipulators often start with making minor requests. Getting people to perform small and relatively unrisky acts now will make it more likely that they will perform larger, more difficult and riskier tasks later. Corollary: giving in now to "minor" requests that are mildly uncomfortable makes it difficult to refuse more difficult and unsettling requests in the future (Freedman, Carlsmith, & Sears, 1974, pp. 395-397). § Manipulators often seem unusually friendly, concerned and sincere. When people perceive that someone likes them or cares about them, they listen less critically to what is told to them and are also less apt to think negatively about the communicator (Zajonc, 1968). Corollary: "love bombing" (being made the center of attention and the target of an unusual amount of praise, affection, etc.) makes it hard to disagree or resist. § Manipulators do not immediately ask for agreement, they ask people to "try it" with an "open mind." Getting people to behave in a manner that is somewhat contrary to their current belief system will often result in changed attitudes (Deutsch & Krauss, 1965; Festinger & Carlsmith, 1968). That is, acting on requests to "try it before you reject it" and assurances that "you can disagree with what you are doing even as you do it" often leads to changes in belief systems, especially if the subject is not overtly rewarded (e.g., by being paid) for performing the new behavior. § It is possible to be hypnotized without being aware of the induction process. Most hypnotic phenomena, including carrying out posthypnotic suggestions, have been produced in subjects who were not aware of being in hypnosis (Erickson, Rossi, & Rossi, 1976). § Hypnosis begins with a shift in attention (Hilgard, 1968). Attention is normally motile. That is, it is dynamic and is relatively freely focused on a variety of events within a large perceptual field; it moves back and forth between the external (e.g., actions and events "outside" the self) and the internal (e.g., thoughts and feelings). Trance is a state that involves relatively focused, fixed or immotile attention. Corollary: anyone or anything that results in decreased motility of attention is highly likely to induce an altered state of consciousness ("trance") whether or not it is labeled "hypnosis." § The language of hypnosis is marked by vagueness, overgeneralizations, metaphors and abstractions. Classical inductions are not the only way to "talk hypnosis" (although they can be found in many "meditation" techniques not overtly labeled as hypnosis). Nonclassical inductions use "normal" conversation and storytelling, often directed at more than one representational system (e.g., sight, sound and touch) to shift attention, in part by activating the subject's tendency to search within him— or herself in order to find ways of relating what is being said now to experiences in the past (Bandler & Grinder, 1975). Corollary: words that sound "deep" or meaningful but feel confusing (and/or strangely calming) can induce trance outside the subject's awareness. § In trance, memories, fantasies, feelings and thoughts are often experienced more vividly and intensely than they are in the normal "waking" state (Hilgard, 1981). If a person is unaware of being in trance, or is unfamiliar or unconvinced of the phenomenon of hypnotic enhancement of perception, fantasy and suggestibility, then that person is likely to attribute the vividness and intensity of the trance experience to some special characteristic of the message and/or communicator. That is, the person links his/her feelings of intensity with what has been said or who has said it, not with how (i.e., hypnotically) it was said. The message is therefore experienced as "more real" or "more true" than other messages, and the communicator of the message is endowed with extraordinary (or even supernatural) characteristics or skills. § Hypnosis involves powerful transference. The induction process involves establishing and utilizing rapport, and hypnosis is perhaps first and foremost an interpersonal process (Fromm, 1979). Most subjects, after being hypnotized, feel closer, more trusting, and more positively about their operator than before. It is always more difficult to objectively assess someone (or what that someone says) after a powerful transference relationship has developed. 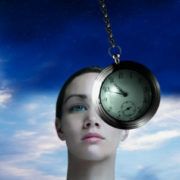 § Hypnosis involves the suspension of "normal" logic. Trance logic is characterized by, among other things, lack of criticalness and the ability to hold two contradictory beliefs as true without one canceling out the other (Orne, 1959). Thus, in trance one can have the sensation of cold and still be aware of being seated in a warm, heated room. Corollary: in trance, people can accept notions or ideas that they would otherwise reject because they contradict other beliefs known to be based in reality. For example, the members of one Hindu-based cult believe that the space program is a hoax and yet may listen to and accept weather reports based on satellite pictures. § "Paraphrase other peoples' thoughts both aloud and to yourself to see if you're understanding clearly." Dr. Zimbardo and his associate, Susan Andersen, recommend that if a message, book or lecture is difficult to understand, repeating the central points in one's own words might help (Andersen & Zimbardo, 1980). Ask questions. If the answer is equally or more puzzling, a mental "beware" alarm should sound. The same alarm should go off if the answer is something like "well, you will understand more later" or "of course you can't understand now, you're too [nonspiritual, unenlightened, intellectual, ignorant, materialistic, rigid, unaware, unconnected with your feelings, etc.]." § Do not relate personal experiences, thoughts or feelings, or make any kind of confession that may be harmful should the information be released, Anderson and Zimbardo (1980) warn. Confidentiality is not automatic: nonlicensed/noncredentialed therapists and their clients may not come under the protection of state doctor-patient confidentiality laws. Groups or individuals that pressure people to reveal personal information may be acting unethically. § Put off any and all decisions until after the group experience is over, and then decide only after obtaining other information or consulting with trusted confidants. § Outside interests and social contacts are vital, state Zimbardo and Anderson, and any group that makes an overt or subtle appeal to sever these bonds should be rejected. These outside sources are usually instrumental in providing reality-oriented feedback, and in helping to maintain a sense of personal continuity (i.e., a sense of knowing "where I came from"). § Any group or individual that arouses guilt to an uncomfortable level should be carefully checked out and probably avoided. § Have at least one good friend who is a "natural born" skeptic or critic. Or, if in a possible mind control situation already, seek out known "doubters" within that group. Put off feeling guilty about doubts for a day or two; discuss doubts now. § Seek outside information before joining or making a commitment to a group. This may be the single most important guideline to follow. Read or listen to critical arguments. If the group claims to be a religion, speak to nonmember clergy or contact the local university's theology department or divinity school and ask about it; if it claims to be a therapy or self-awareness group, contact the local or state Psychiatric or Psychological Association and ask for information, references and research on the group and/or the methods it uses. If the group seems like it might be cultic, contact the American Family Foundation (phone: 941-514-3081). These organizations are responsible and can act as guides to information that may be difficult to locate on one's own. They can also usually find former members of the group in question for in-person or telephone consultation. Become familiar with the literature on deception (some of which makes for highly entertaining reading!). The field of spiritualism and paranormal/parapsychological research has been so riddled with deception and fraud that the Parapsychological Association itself has formerly admitted to the need for "fraud checks." A number of professional magicians, most notably James Randi ("The Amazing Randi") have made careers out of debunking fraudulent and shoddy research on the paranormal, and have exposed the deceptive tactics employed by scores of well-known "psychics." The Parapsychological Association now recommends that scientists consult magicians when designing experiments to test for psychic and spiritualistic abilities, in large part because scientists are not particularly better than the average person at seeing through deceptions. Finally, self-knowledge—the ability to (with some objectivity) observe and reflect on one's own behavior—and a sense of humor about oneself and others allows for greater independence in general, and increased freedom of thought in particular. Most cults discourage self-reflective thought (it is too "intellectual," "egotistical," "nonspiritual," "negative," and/or "selfish") in favor of "feeling" or "listening to the heart." In contrast, nontotalitarian groups are characterized by open questioning of authority and leadership. Think back to situations in which you have felt pressured or covertly influenced. How did it feel? In retrospect, what were some possible warning signs (e.g., disorientation, confusion, anxiety, guilt, sadness, embarrassment) that a deception was about to occur? These signs can be "warning bells" to protect against future deceptions. What is intimacy? What does it mean to be a friend? Do true and lasting friendships come instantly, or are they built, sometimes in struggle and/or pain? What is love? When is love unconditional? Is it possible to be completely open, or to love instantly, or completely, or equally? Think back to the past in order to begin to answer these questions. Be familiar with trance experience; know what hypnosis feels like and experience a variety of inductions. Again, these feelings can serve as an "early warning system," as clues that one has been in hypnosis. Hypnosis can then serve as an alternative explanation for "mystical" or "psychic" experiences that may have been manipulated. No two people feel exactly the same under hypnosis; everyone has a unique response. Recall previous experiences with deception (e.g., magic shows). Be aware that people are in general easily fooled, and that most if not all "supernatural powers" are easily reproduced by magicians/illusionists. The world is full of mysteries, but what seems to be impossible to explain does not necessarily mean it cannot be explained by conventional logic or "mundane" science. Remember how impossible many magic tricks appear to be! What if the magician claimed to be a prophet, and that his "powers" were in fact "gifts from God" and thus proof of divine status? Absurd, perhaps, but it is the rare mystic or cult leader who can perform more than the most basic "mind reading" tricks, yet they continue to attract followers who are convinced of their guru's "divine nature." With the advent of electronic mass media and telecommunications, we are experiencing an explosive escalation in the amount of information that is available at any given moment. Moreover, this information is available instantaneously at the turn of a dial or the flick of a switch, and it is typically available in great amounts. In communications, we know that with every increase in the volume and flow of information, there is a subsequent increase in the transmission of "noise" ("information" that is erroneous, irrelevant or simply invalid). As consumers of ever-increasing amounts of information, we will be hard-pressed to tune out the "noise" in order to receive and integrate that information that is in fact "meaningful." While the systematic use of manipulative communication and social coercion ("brainwashing") has existed for thousands of years, a number of factors have in the past few decades converged to forge, for the first time ever, mass-marketed, readily-available and, in many cases, highly lucrative technologies of conversion. If, as many researchers now suggest, we consider heightened suggestibility to be the central phenomenon underlying the construct "hypnosis," then any technique or tool that, as a direct or indirect result of its employment, results in increased suggestibility can be thought of as "hypnotic." As our understanding of hypnotic communication and our ability to subtly influence behavior increases, it may become the obligation of the professional persuader (the hypnotist, the psychotherapist) to assist clients to develop their resistance to manipulative groups and individuals. Anderson, S., & Zimbardo, P. (1980, November). Resisting mind control. USA Today reprint. Bandler, R., & Grinder, J. (1975). Patterns of the hypnotic techniques of Milton Erickson, M.D. (Volume 1). Cupertino, CA: Meta Publications, 1975. Clark, J., Langone, M., Schecter, R., & Daly, R. (1981). Destructive cult conversions: Theory, research and treatment. Weston, MA: American Family Foundation. Cunningham, S. (1984, October). Zimbardo: Coming close to 1984 [report on lecture by Philip Zimbardo]. APA Monitor, p. 16. Deutsch, M. & Krauss, R. (1965). Theories in social psychology. New York: Basic Books. Dubrow Eichel, L. (1984, October). The manipulation of spiritual experience: Unethical hypnosis in destructive cults. Paper presented at the annual meeting of the Association to Advance Ethical Hypnosis, Boston, MA. Dubrow Eichel, L. & Dubrow Eichel, S. (1985). The manipulation of spiritual experience: Unethical hypnosis in destructive cults. Philadelphia: Re-Entry Therapy, Information & Referral Network. Erickson, M., Rossi, E., & Rossi, S. (1976). Hypnotic realities: The induction of clinical hypnosis and forms of indirect suggestion. New York: Irvington Publishers. Festinger, L. & Carlsmith, J. (1968). Cognitive consequences of forced compliance. In L. Wrightsman (Ed. ), Contemporary issues in social psychology (pp. 205-212). Belmont, CA: Brooks/Cole. Freedman, J., Carlsmith, J., & Sears, D. (1974). Social psychology (2nd ed.). Englewood Cliffs, NJ: Prentice-Hall. Fromm, E. (1979). The nature of hypnosis and other altered states of consciousness: An ego-psychological theory. In E. Fromm & R. Shor (Eds. ), Hypnosis: Developments in research and new perspectives (2nd ed.). New York: Aldine. Hilgard, E. (1968). The experience of hypnosis. New York: Harcourt Brace Jovanovich. Hilgard, E. (1981). Hypnosis gives rise to fantasy and is not a truth serum. Skeptical Inquirer, 5, 16-24. Jones, E. & Gerard, H. (1967). Foundations of social psychology. New York: John Wiley & Sons. Orne, M. (1959). The nature of hypnosis: Artifact and essence. Journal of Abnormal and Social Psychology, 58, 277-299. Schwartz, L. & Kaslow, F. (1981). The cult phenomenon: Historical, sociological, and familial factors contributing to their development and appeal. Marriage & Family Review, 4, 3-30. Zajonc, R. (1968). The concepts of balance, congruity, and dissonance. In L. Wrightsman (Ed. ), Contemporary issues in social psychology. Belmont, CA: Brooks/Cole, pp. 205-212. This article first appeared in Suggestion: The Journal of Professional & Ethical Hypnosis, 1, (Summer 1985), pp. 34-44. It is reprinted with permission of the author.